Visit of His Highness Prince Aga Khan to Atlanta - 2008-04-17 | Ismaili.NET - Heritage F.I.E.L.D. On Thursday, April 17, 2008 Atlanta will welcome His Highness Prince Aga Khan, the spiritual leader of 15 million Shia Imami Ismaili Muslims. 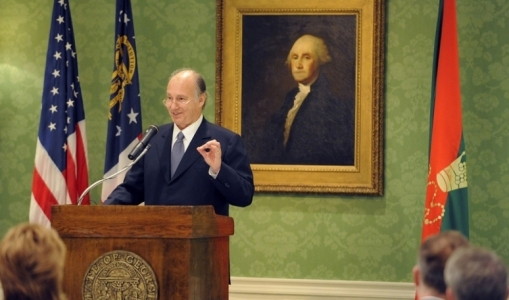 The Aga Khan, at the invitation of Governor Purdue, will visit Atlanta as a part of four city visit he is undertaking to celebrate his Golden Jubilee, the 50th year as the Imam. He will be in Atlanta for three days following his visits to San Antonio, Los Angeles and Chicago. His visit will witness the gathering of over 25,000 of his followers from over 30 countries. The first day of his visit will be dedicated to private visit with his followers at GICC. Who is the Aga Khan and who are the Shia Imami Ismaili Muslims? Designated by some as Islam's Quiet Revolutionary, His Highness the Aga Khan is the 49th Imam of the Shia Imami Muslims who belong to the Shia branch of Islam, a community of 15 million residing in United States, Canada as well as Central and South Asia, Africa, Middle East, Europe and Australia. In common with other Shia Muslims, the Ismailis believe that after the Prophet's death, Ali ibn Abi Talib, the Prophet's cousin and son-in-law, became the first Imam, spiritual leader of Shia Muslims and that his spiritual leadership of the community has continued thereafter by hereditary succession. Succession to Imamat is by designation by the current Imam. Under the Ismaili tradition the Imam has the absolute right to appoint his successor from amongst his male progeny. His Highness Prince Karim Aga Khan is the 49th hereditary Imam of the Shia Imami Ismaili Muslims. He was born in Geneva, Switzerland on December 13, 1936. He spent his early childhood in Nairobi, Kenya, attended Le Rosey School in Switzerland and graduated from Harvard University in 1959 with a Bachelor's Degree in Islamic History. On July 11, 1957, at the age of 20, he was appointed the 49th Imam of the Shia Imami Ismaili Muslims. Since assuming his office fifty years ago he has dedicated his life to spiritual and economic welfare of his followers as well as the Muslims the world over. He has continually expressed his concerns about Muslims, particularly in the face of challenges the Muslims face in today's environment. He represents the lone voice of moderation and understanding in a world that is hostile to Muslims. He continues to emphasize the view of Islam as a thinking, spiritual faith and one that practices compassion and tolerance of other faiths. Under his guidance Ismailis have developed an ethos of self-reliance, unity and common identity. The community has a well defined institutional framework the world over to look after the welfare of its members as well as the communities they live in, and to build capacity for a just society. The Aga Khan's concern about the well being of fellow Muslims has led to the evolution of the Aga Khan Development Network, a group of complementary institutions working for the common good of humanity in the fields of architecture, education, health, economy and private sector enterprise development. The Commemoration of His Highness the Aga Khan's Golden Jubilee began on July 11, 2007 and will continue until July 11, 2008. His Highness will pay official visit to some 35 countries, meet with government leaders and set direction for the future for his followers. Who then are the Shia Imami Ismaili Muslims? Ismailis, as they are known have been in Georgia since the early 1970's and now number almost 15,000 strong in and around the city of Atlanta. Most came with little or no capital but given the opportunity have succeeded far beyond anyone's expectations. A gas station, a convenience store or a fast food restaurant that you visit in Georgia is more often than not owned and operated by an Ismaili. Rather than maintaining a separate identity they have become an integral part of the community. The Ismailis are a community of ethnically and culturally diverse people living in over 30 different countries. They are united, however, in their allegiance to their Imam, His Highness Prince Aga Khan, the 49th hereditary Imam (spiritual leader) of the community and a direct descendant of Prophet Mohammed (peace be upon him). The Ismailis belong to the Shia branch of Islam, the other being the Sunni branch, which is the predominant branch in the Muslims world. The Vatican recently announced that on a world wide basis there are now more Muslims than Catholics in the world. Qur'an defines a Muslim as one who submits to the will of God. Muslims in America belong to over 50 different ethnicities and nationalities and mirror the diverse face of the nation. They all recite the Shahada, "I bear witness that there is no God but Allah and I bear witness that Muhammad is the last and final Prophet of Allah". Muslims believe that the Qur'an represents the culmination of the message that had been revealed through other Prophets of Abrahamic tradition before Muhammad, including Abraham, Moses and Jesus, all of whom Muslims revere as Prophets of Allah. As Ismailis we are enjoined to live by the values and ethics of Shia Imami Ismaili Muslims which include values of peace, of generosity, of harmony, of philanthropy and of caring for the aged and the infirm and the weakest in society. In the Shia tradition of Islam, the Imam has mandated that the followers safeguard the individual's right to personal intellectual search and to give practical expression to the ethical vision of society that the Islam inspires. And yes, I am a Shia Imami Ismaili Muslim and a follower of His Highness the Aga Khan. I hope you all will join us in extending a warm Georgia welcome to the Aga Khan.